30 Days of Artists: Candice and Erin are back with bold, opulent design. Artistically-minded with a flair for the unconventional, Candice has a strong passion for creating elaborate costumes and headdresses. So it only makes sense that she returns to Art Bra Austin with another beautiful art bra for her close friend and Art Bra Model, Erin Finney. You may remember Erin’s “Getting’ Funky” art bra last year – another Candice creation – as she truly got down and funky on the Art Bra Runway! You could say exciting charity events are kind-of Candice’s thing. She is the founder of Austin Influential Group, known for producing lavish charity events such as the annual Secret Society Ball, Dream of the Red Chamber series and Derby Day benefits — all supporting local non-profits, including Austin Pets Alive!, Planned Parenthood, and Ride On Center for Kids. When Candice isn’t putting on these over-the-top, themed charity events or working on her next art bra masterpiece, she’s hosting retro dinner parties, enjoying roller skating, or showing off one of her elaborate headdresses while performing onstage as a burlesque dancer. Learn more about the Candice and The Austin Influential Group on Facebook. After purchasing a black bra with pink lace, Candice covered all of the lace with black stretch felt and stretch lace. Stretch ribbon was then used to cover the vertical pink piping down the front – a task she describes as one of the more “arduous” undertakings in her work. Next came the space planning and alignment of all the jewelry pendants and strategically gluing them all into place. To finish the look, Candice custom-designed a glorious golden Metropolis-inspired headdress to accompany the art bra on the runway. 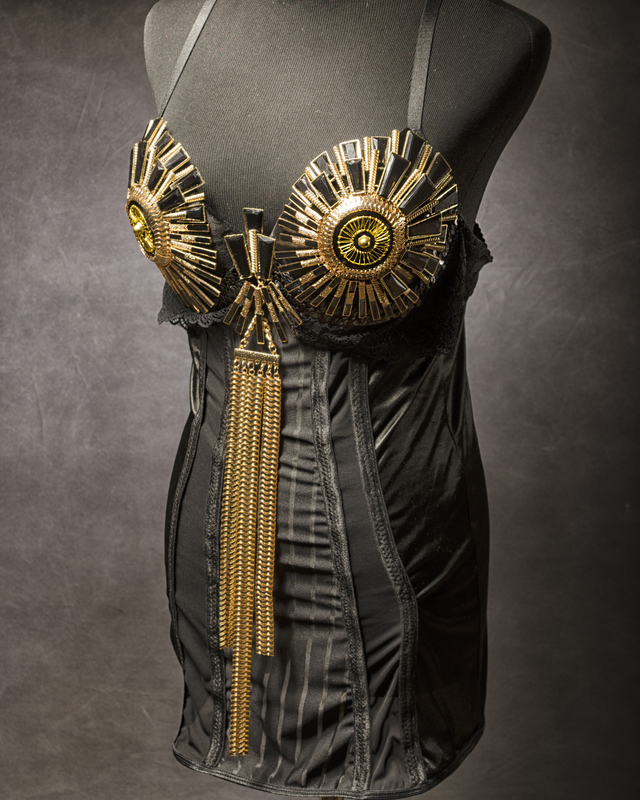 The entire piece is decadent throughout and there is no question its wearer, Erin, will feel magnificent on the night of Art Bra Austin. Bravo, Candice!